This Beach and Camping Cart designed with an articulating rolling chassis to accommodate the Adventurer. This build includes a Knotty Hickory Wood Top and lower Shelf on a Black Powder Coated Frame. Other add on features include a Bottle Opener, Brass Utensil Hangers and 15” Pneumatic Wheels. 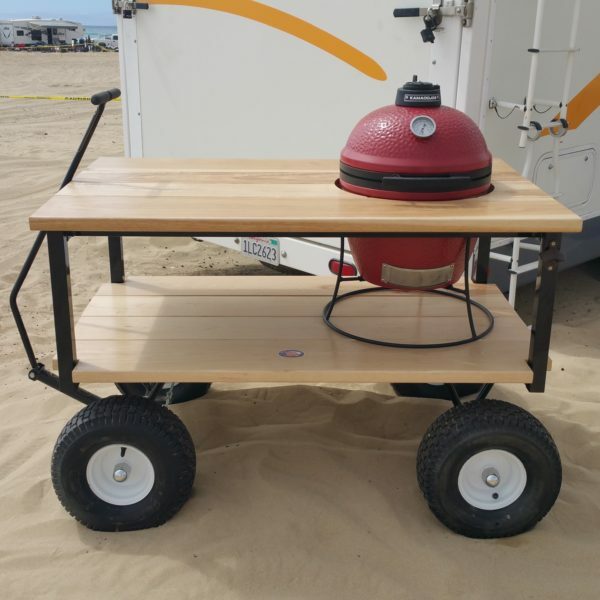 This Brian Alan Table can be customized to hold a variety of Kamado Style Grills from Mini’s to Large in size.